Since U.S. President Barack Obama and Cuban President Raul Castro publicly announced plans a year ago for the two countries to begin efforts to normalize ties, the U.S. and Cuba have made significant strides in improving relations. However, some analysts say the thorniest issues remain on the table. Those issues include U.S. congressional action to remove the trade embargo against Cuba, said William LeoGrande, a Latin American politics specialist at American University in Washington, D.C.
LeoGrande said another contentious issue is the continued U.S. military presence in Guantanamo Bay, Cuba. “The U.S. recognizes that Guantanamo is in fact sovereign Cuban territory,” he siad. “But we insist on the treaty that was signed in 1934 that gives the United States the right to lease the base in perpetuity." FILE - This house used to belong to U.S. citizen Daniel Smith in the Isle of Pines, Cuba. Photo taken March 2015. The property was confiscated by the new Cuban government after the revolution. There is also concern about the return of property belonging to U.S. businesses that was seized after the Cuban revolution in 1959. The property is estimated to be worth at least $6 billion in today’s value. The U.S. and Cuba recently addressed the issue in Havana, in the first government-to-government talks on the topic since the start of efforts to normalize ties. In a background briefing, a State Department official said the talks were a “first step” in a “complex” process that would take some time to resolve. “This was a very preliminary meeting and both governments used it as an opportunity to exchange information in a very general matter about claims,” the official said. Most U.S. companies involved in the claims do not want their property back but are instead seeking an opportunity to do business with Cuba again, LeoGrande said. “Coca-Cola does not want to repossess a 1950s bottling plant,” he said. “What they would like to do is to get into Cuba and open a new bottling plant to sell Coca-Cola to Cubans." FILE - Cuban migrant Mailin Perez is greeted by her husband, Jose Caballero, after arriving at a bus station in Texas, via Mexico, in this 2014 photo. In spite of improved relations between the U.S. and Cuba, the U.S. Customs and Border Protection agency said the number of Cubans arriving at U.S. ports of entry rose 44 percent in 2015, compared to the previous year. The agency said arrivals of Cuban migrants have trended upward each year since 2009. Some analysts say the uptick is a reflection of the economic hardships that many Cubans face and disillusionment with the Castro regime. “Cubans are desperate,” said Jose Azel, a Cuban-American studies professor at the University of Miami in Coral Gables, Florida. “The illusion that Raul Castro was going to make some changes, economically, at least, has now been totally shown to be false,” Azel added. He also said the U.S. should have sought more concessions from Cuba on its human rights record and treatment of detainees before opening the doors to normalization. “I think we have made a serious mistake by beginning going down a process without demanding concessions from Cuba,” Azel said. 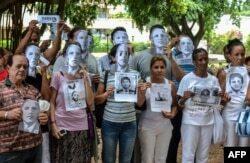 FILE - Cuban dissidents pose wearing masks depicting US President Barack Obama and holding pictures of imprisoned dissidents as they protest against the reopening of the US embassy in the island, Aug. 9, 2015. However, U.S. officials say restoring ties opens the door for U.S. and Cuba to have direct dialogue on issues such as human rights, which is among the issues being discussed in working group meetings between the two countries. Over the past year, the two countries have reached several milestones including the U.S. removal in May of Cuba’s “state sponsor of terrorism” designation and the restoration of diplomatic ties with the re-openings of the U.S. and Cuban embassies. LeoGrande said overall, he expects U.S. normalization with Cuba to move faster than it has with some other countries, because there’s strong interest on both sides for completing the relationship.